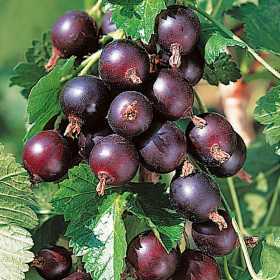 Jostaberry is a cross between a blackcurrant and gooseberries. It forms a very vigorous spineless shrub, growing up to 1.8-2m tall and a similar size across, and is self fertile so only one need be grown. The fruits are larger than a blackcurrant and are dark reddish black in colour. These are more like a gooseberry when slightly unripe, but similar to a sweetish blackcurrant when fully ripe in late July, early August. Jostaberry bushes begin to crop well after two years, and up to 4-5kg fruit per bush is possible. In the UK, Jostaberries are usually sold by their generic name rather than as a named variety. Jostaberries are resistant to the most serious of the diseases which affect either of its parents: American Gooseberry Mildew, Blackcurrant Big Bud Mite and Blackcurrant Leaf Spot. Birds do like the fruits however, and so bushes should be netted to protect them as soon as they start to change colour from green. Jostaberry flowers need protection from frost damage in colder or more exposed areas of the country. Fleece can be fastened over them, secured with clothes pegs. Jostaberries can be grown as free standing shrubs, or trained against a wall. They thrive in moisture retentive fertile soil in full sun, although they will tolerate shade for part of the day. 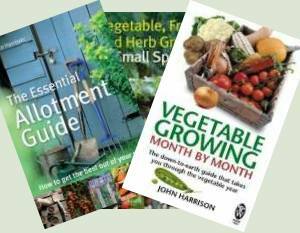 Plants are available potted or bare rooted, and can be planted any time between mid November and March, provided the soil is not frozen. They should be planted at the same soil level as previously. 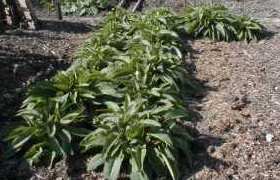 The planting hole should have some well rotted manure or compost dug into the bottom, and once the plant is firmed in, a sprinkling of Fish, Blood and Bone raked into the surface of the soil, and the surrounding area mulched to retain moisture. 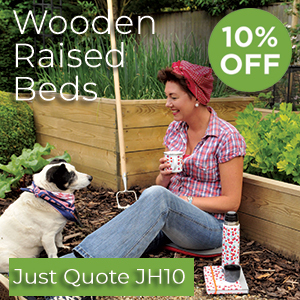 Bushes benefit from additional fertiliser early each Spring, and the mulch should be topped up. During dry spells, they should be watered well, especially during the first year after planting. Fruit is borne on wood that is one, two or more years old. Bushes should be pruned to create an open framework of upright branches. About half of the new growth each year should be removed, and any older, less productive branches or those growing at odd angles should be cut out cleanly just above ground level. Jostaberries are easy to harvest, and can be picked individually to avoid damaging the fruits. They freeze well and can be defrosted to use in the same way as fresh fruits. Very ripe fruits are sweet enough to eat fresh with cream, or as part of a mixed fruit salad, where their dark colour provides contrast. Cooked, they can be used as pie filling, for crumble or fruit fool, or for jam making.